This article will show the basic steps to installing the Pro Performance 14” Revelator kit onto a C10 rear axle. Some C10 rear axles have press-on backing plates, and will not work with this type of backing plate. They must have a bolt-on backing plate. 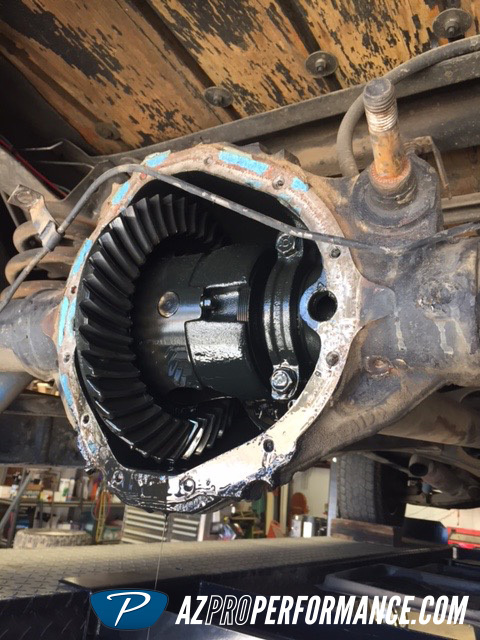 This is a good time to replace all rear axle oil, and inspect gears. First step is to remove the axles. To do this, remove the rear cover off the housing, and locate the large pin in the differential. This pin will need to be removed, so the axles can slide into the rear differential, and c-clips removed. This pin will have a locating bolt threaded into it, that must be removed to release the pin and allow it to be pulled out. Once the pin is removed, you can push in each axle, and remove the c-clip from inside the differential. Be careful, as this can fall into the rear end housing and be a little more difficult to retrieve. I recommend using needle nose pliers to grab the clip as you have someone else push the axle in. After the c-clips are removed, you can then pull the axles out of the rear end. Be careful to slide out carefully, as to not damage the seals or bearing in the end of the housing. Disconnect the e-brake cable as the junction on the trailing arm. With axles removed and e-brake disconnected, you can now remove the backing plate assembly with the brakes shoes all attached. Your main housing bracket can be installed onto the housing using the original bolts holding the previous backing plate on. We opted to use new hardware for this install. 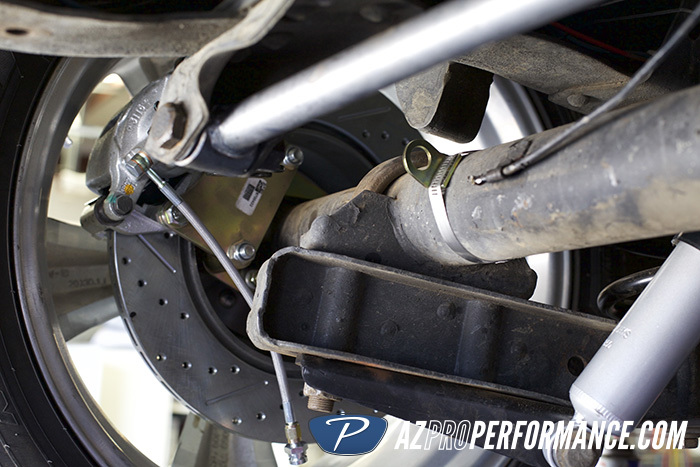 You may clock this bracket differently, and will not affect the braking performance. You just want to make sure the bleeder screw is facing upward. This bracket can be installed on the leading side of the axle as well, but again to make sure the bleeder screw is facing up on the caliper. The intermediate brackets will be installed next. 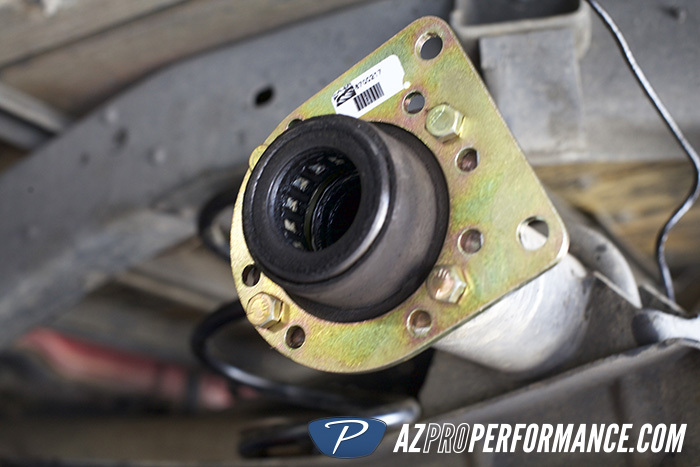 You will have long bolts and spacers that get used when installing this intermediate bracket. The curved side of the bracket will be the side that the caliper itself bolts onto. Install the axles back into the housing. You might have to rotate the axle slightly in order to get the splines lined up inside the differential. At this point, you can re-install the c-clips and the main pin into the differential. Seal up the cover and fill back up with fluid. We are using new 5-lug Moser conversion axles for this install, but stock axles can be used as well. The hub-centric ring will need to be installed next. They are color coded, in which the rear will use the gold colored ring. 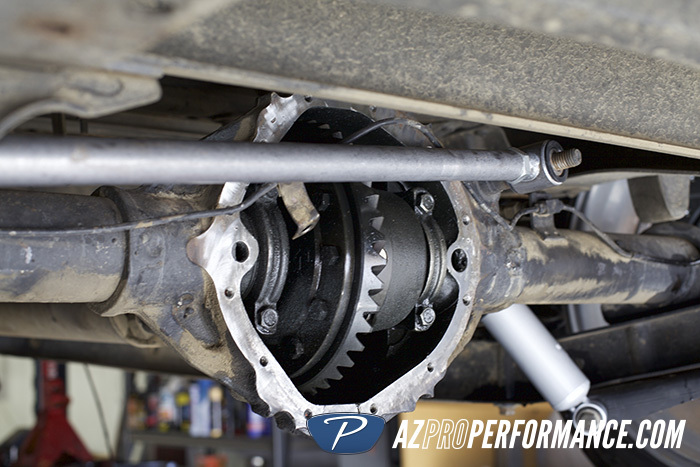 If not using new axles, make sure to clean up any debris or “roughness” on the axle pilot. This ring fits very tight, and needs to have a clean, smooth surface to slide onto. Once the ring is on the axle pilot, install the rotor onto the axles. 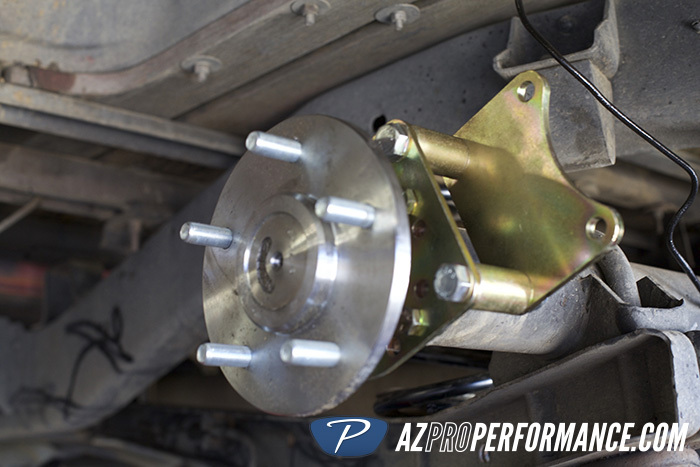 You can use a lug nut to hold the rotor firmly onto the axle, while you proceed to future steps. The rotor is directionally vented, so there is a left and right. Please reference the picture below, as the front of the truck will be to the left of the rotor. 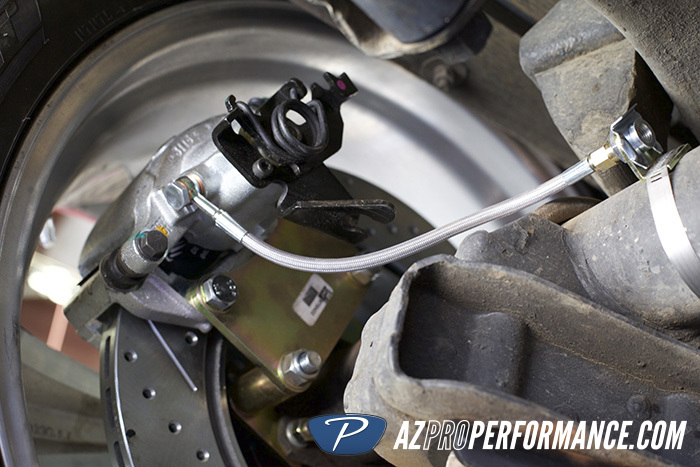 DO NOT hardline directly into the rear caliper, as it does need to move. This will also allow you to remove the caliper and replace pads in the future, without breaking the seal on the hydraulic brake system (causing you to re-bleed the system). 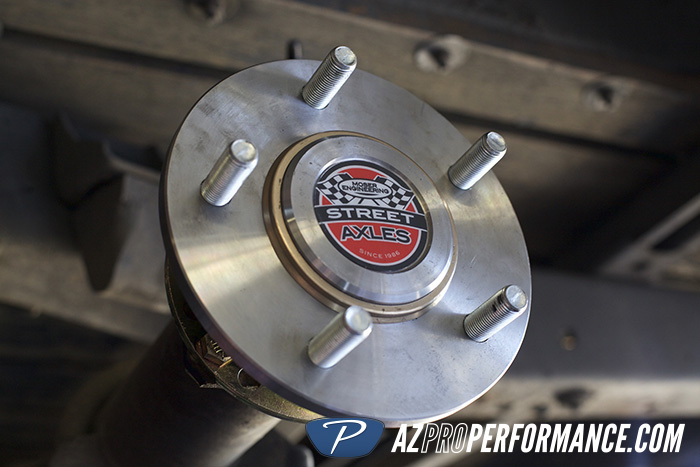 If you purchased the optional SS brake hose kit with your brake system, these next steps will be a guide to installation. Locate the bulkhead fitting tab and place it on the axle, leaving enough slack in the line for the caliper to move side to side. It is a floating caliper to work correctly with the c-clip axles. 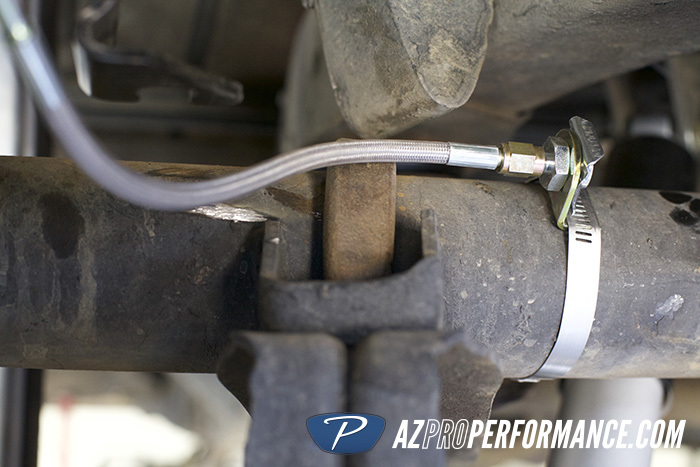 Once a spot is located, use the hose clamp to secure it to the axle housing. You can weld this to the rear axle as well, and make sure to sand the zinc coating off for proper welding. 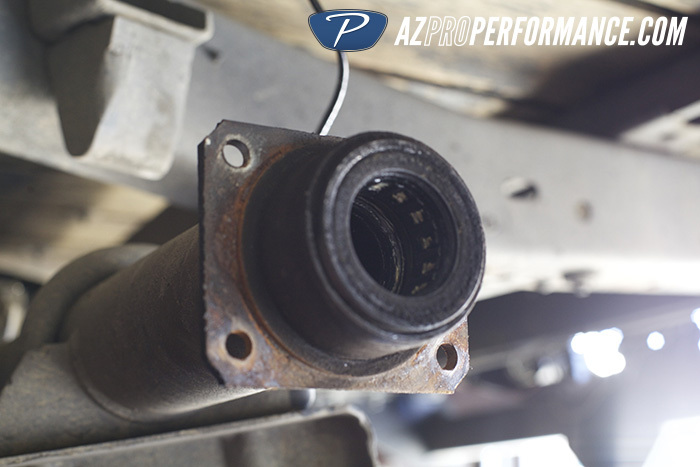 You will need to cut back your hard lines on the axles, and re-flar to insert into the new brake hose fitting.